Horse Eats Hat was Orson Welles’ title for his Mercury Theater production of Labiche & Michel’s The Italian Straw Hat, in which a horse makes a snack of a hat that belongs to wife while she is meeting with her lover, and the man to whom the horse belongs (who is about to get married), has to find a replacement hat so the wife’s husband doesn’t shoot her before he can marry his bride, whose father is ready to call the whole thing off. 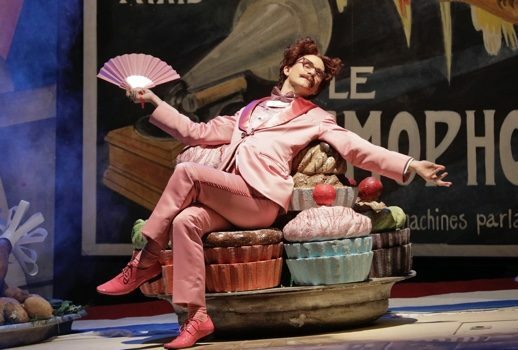 Rota, whose own sound is so distinctive, is equally facile at whipping strands of Mozart, Rossini, Mascagni, Puccini, Verdi, and Wagner through this vaudeville confection like whipped cream in a mousse. It should come as no surprise. He taught at, and was director of, the Liceo Musicale di Bari for over 30 years, studied composition both in Italy and at Curtis (at the suggestion of Toscanini) while managing to compose over 150 movie scores. In the opera, as in the play, the chaos is nonstop, the comedy is broad and physical, and requires a large ensemble of singers who can execute Rossinian polysyllabic patter while taking pratfalls. The Minnesota Opera production, directed by Andrea Cigni, is light on its feet, unafraid of slapstick, musically spot on, and, if not startlingly original, honors the comedic traditions that give the opera its peculiar charm. The production, touted as “50s,” in the company’s PR, really isn’t, and to the good. While the chorus of milliners was very Broadway-in-the-50s, the Baroness’s salon was a surreal conflation of the Merry Widow and She Done Him Wrong. Victoria Vargas, the Baroness with a Gloria Swanson entrance and a Bette Midler exit, wielded a big, glamorous mezzo as well as a sea of sequins and a giant carrot. Overall the cast is young, earnest, and game (which is generally the case at MNOpera). Kudos to Dale Travis and Dennis Petersen as the irritated father of the bride and her wry uncle, respectively, for their polished musicality and sly humor; to Christian Sanders as Viscount Achille di Rosalba, a pencil-thin queen in a bright pink suit, for impressively wielding a giant banana; to Pietro di Bianco for playing an old cuckold twice his age with Rossinian panache and Verdian intensity; to Lisa Marie Rogali and Danielle Beckvermit — the bride and the unfaithful wife — for hitting their bel canto marks while making us laugh; and to Andrew Stenson, the tireless Fadinard, who never flagged nor failed to bring a bright lyric tenor to the madcap proceedings. As in all successful ensemble productions, the whole is greater than the sum of its parts, in this case adding up to pure musical fun with never a dull moment. As I got in my car to go, the temperature was -25° — -55° “RealFeel” — and I thought I was crazy driving to the Ordway for a slight, rarely performed Italian farce. But I’m really glad I did.